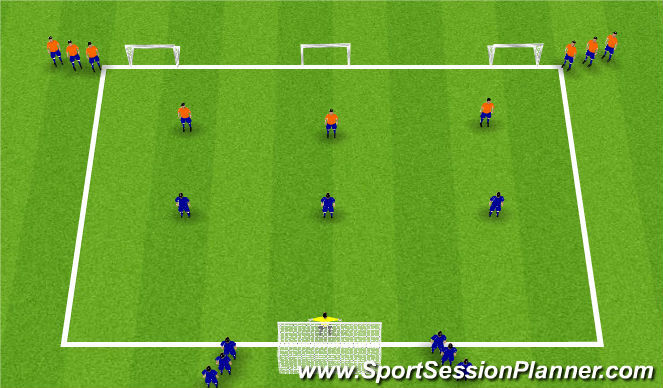 2 v 2 focusing on immediate pressure & cover. 30 seconds to score. CP: Encourage immediate pressure to prevent shot. Preseure, jockey, delay and force to cover. Balance on balls of feet, no bend at hip, busy feet. Avoid ball watching, hands on attacking player, mentally prepared to go with run. *Area 25x15 yds, with a 5yd end zone, set out as illustrated. *7 players (incl. GK), arranged 3 Attackrsv 1 Defender, 1 ball. 1. Practice starts with: Coach feeds the ball to one of the 3 A&apos;s.
2. After first touch by A&apos;s the 2 recovering D&apos;s chase back to defend. 3. Practice both with & without off-side restrictions. 4. 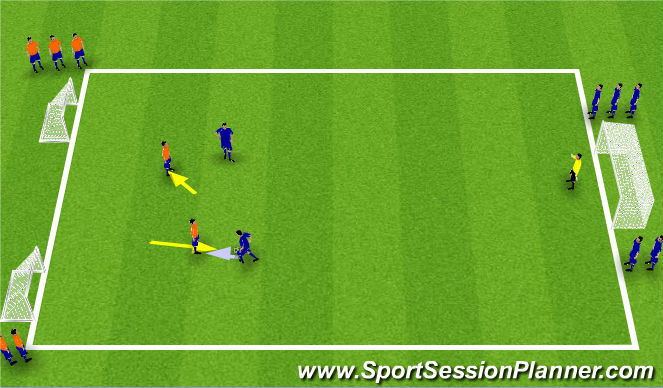 If D&apos;s gain possession or GK saves their objective is to combine to get the ball over the start line. 5. If this is achieved roles are reversed, with A&apos;s becoming D&apos;s.
1. 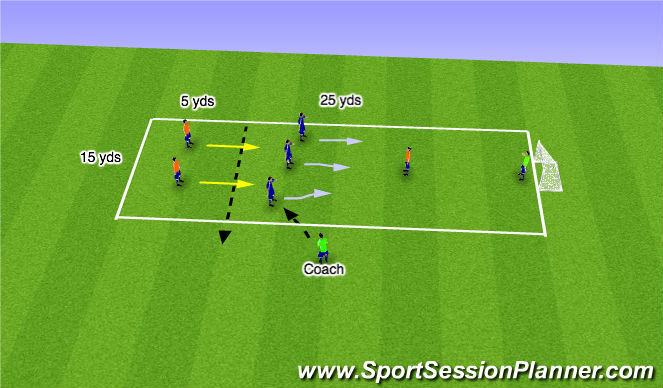 First D works on delay & slow withdrawal of position to gain time for recovering defensive support. 3. Recoving D&apos;s work on lines of recovery back to goal. CP: Focus on Group Defending Session. Add neutral player as necessary.